The Worst Year For Ice Damming - Now What? The Worst Year For Ice Damming – Now What? Ice and icicles on your roof may be cute, but they can tear off gutters, loosen shingles, and cause water to back up into your house. As snow continues to pile up on people’s roofs this winter, homeowners are up against more than cold morning commutes. The snow buildup, combined with ice weight, is causing damage, leaks, and the threat of roof collapses. Though a collapse tends to be the first thing that comes to a homeowner’s mind, they are rare, The real worry is ice dams. Although sometimes thought of as a problem with roofing or attic ventilation, ice dams are caused by the presence of warm air in the attic, combined with snow on the roof and the right weather conditions. When heat leaks into the attic, it melts the underside of the snow on the roof, which then flows down the roof surface until it reaches a cold spot (such as the eaves or soffit) where it forms a frozen dam. The ice build-up can back up under the shingles, damaging them and allowing water to leak through the ceilings and walls below. Shingle roofs are not designed to be waterproof; they’re designed to shed water. Once water has accumulated and had nowhere to go, it finds a way to the home through nail penetrations and behind flashings. As the weather warms, ice builds up as the warm attic continues to melt snow. As more snow melts due to the warm attic, the water moves toward the gutter and encounters the dam. The ice dam backs the water back up into the house, and the damage begins. a penetration into the attic space (around wires, plumbing vents, light fixtures, chimneys, knee walls) there is the potential for air leaks. Even homes that are only a few years old may not be adequately sealed. To avoid these types of problems and eliminate most ice dams, attic air leaks must be sealed with caulking or expanding spray foam. 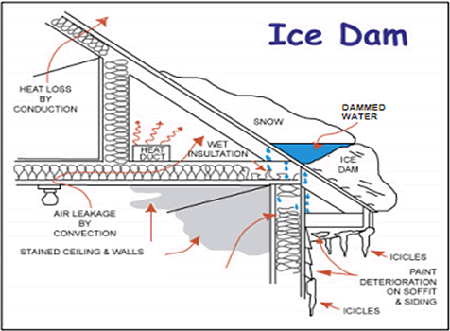 Inadequate insulation, especially near the eaves, is also a contributing cause of ice dams. Sealing attic air leaks saves energy and is essential to preventing ice dams. An energy audit with an infrared scan can pinpoint trouble spots. If snow and ice must be removed, hiring licensed roofing contractors that use steamers is strongly recommended. Installing heating cables will shorten the life of your roof and cost you money to operate. Removing ice with shovels, chippers, chemicals, or heat can damage shingles, gutters, and other building components—and can be dangerous. Adding roof vents—including powered vents—will not eliminate ice dams, and often makes the problems worse. Additional insulation—especially on the top plate of exterior walls—can reduce heat transfer to the roof deck, but insulation alone is insufficient. Typical attic insulation will not stop air leaks or prevent ice dams. Ice dams themselves aren’t necessarily a problem. It’s the leaks that do the bulk of the damage. If you can’t detect signs of leakage, either in the soffits on the outside or in the attic or ceilings, you may not have to do anything. Then during warmer weather, apply the prevention strategies we listed earlier. If you have leakage from an ice dam and can’t rake the snow off the roof, the best way to get rid of the ice dam is to hire a roofing company to steam it off. A steamer is like a pressure washer, except that the water is hot. It melts the ice away without damaging the roofing. Chipping the ice off with a hatchet or an ice pick can break or puncture the shingles.